Today was rather backwards. I started FRENCH ONION SOUP after breakfast, we ate BREAKFAST BREAD PUDDING for supper, and after supper, I made ORANGE SWEET ROLLS. 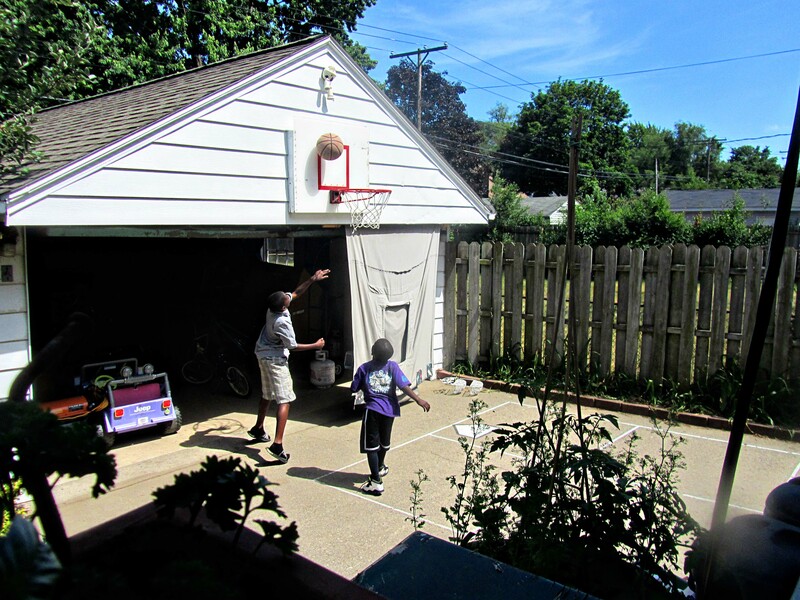 Some friends came over right after breakfast to play basketball. The oldest boy was playing in his favorite flip-flops and his brother landed on his flip-flop right as he was going up for a dunk. 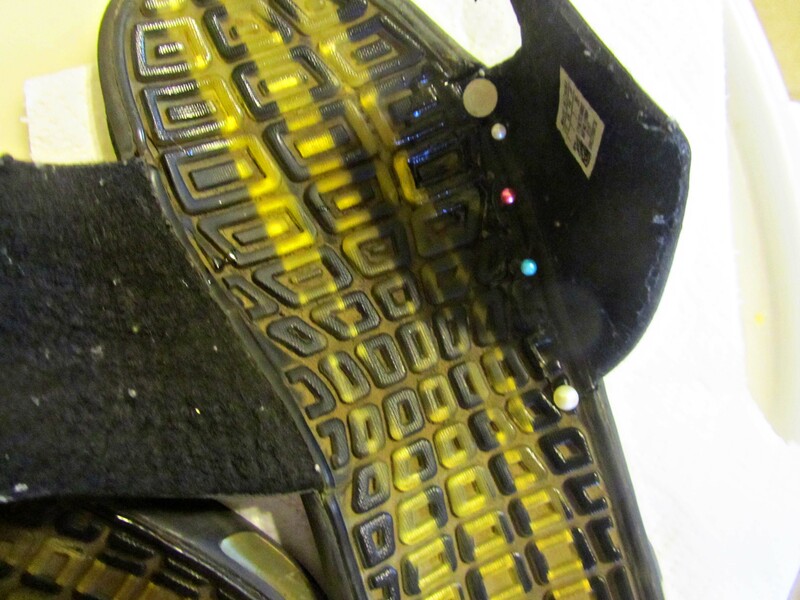 The flip-flop was badly injured and since I am into Eastern medicine, I performed some acupuncture to ease the pain. And since I am also into Western Medicine, I administered a dose of Epoxy into the joint. 24 hours later, the flip-flop was mended. Regardless of the attention given to the flip-flop, he still stank. I think his body was just full of toxins that he was trying to sweat out. I am very sorry that I started a cooking post with that story. 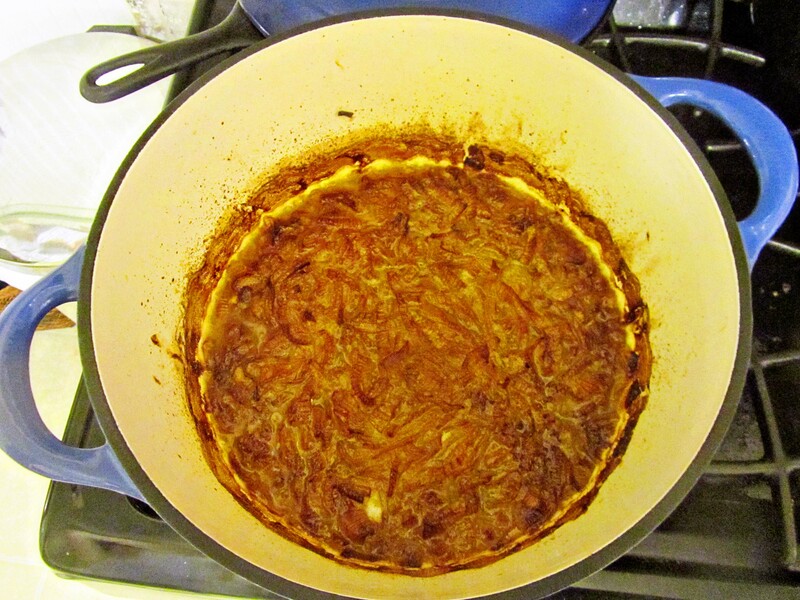 Let’s clear the air by cooking up a pot full of onions. 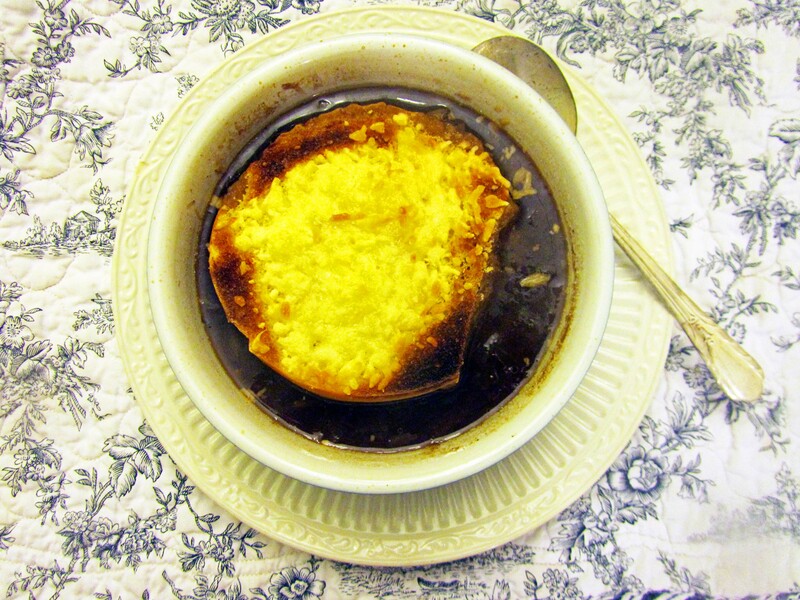 FRENCH ONION SOUP (pg. 84) is something I love to order in a restaurant–and not just any restaurant. This means that I only get FRENCH ONION SOUP about once every two years. The last time I ordered this soup I was in Chicago at a Greek restaurant, and our friends recommended it. I know there is a correct way to chop an onion, so here is a quick video clip. Ignore all the flashing knives at the beginning, it really isn’t a horror show, just a short video clip about onion chopping. 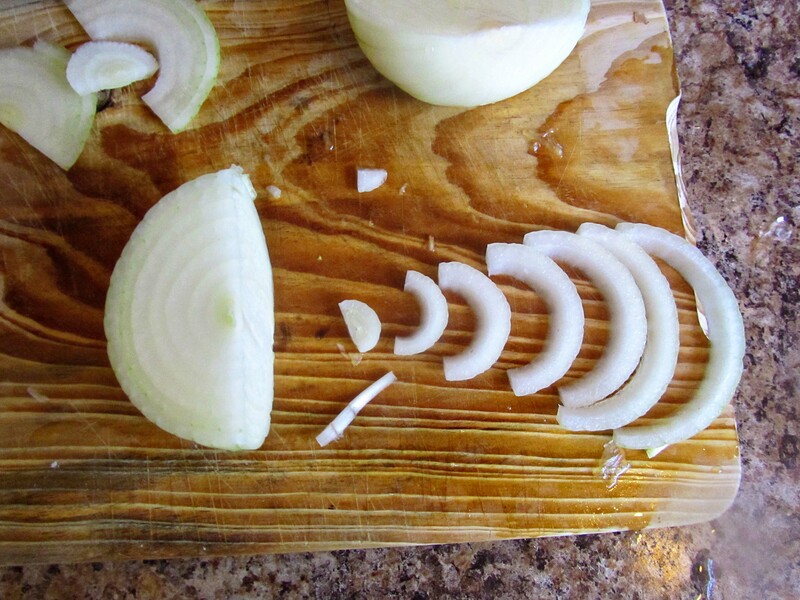 This is THE WRONG WAY to cut an onion. Every place I read told me so. 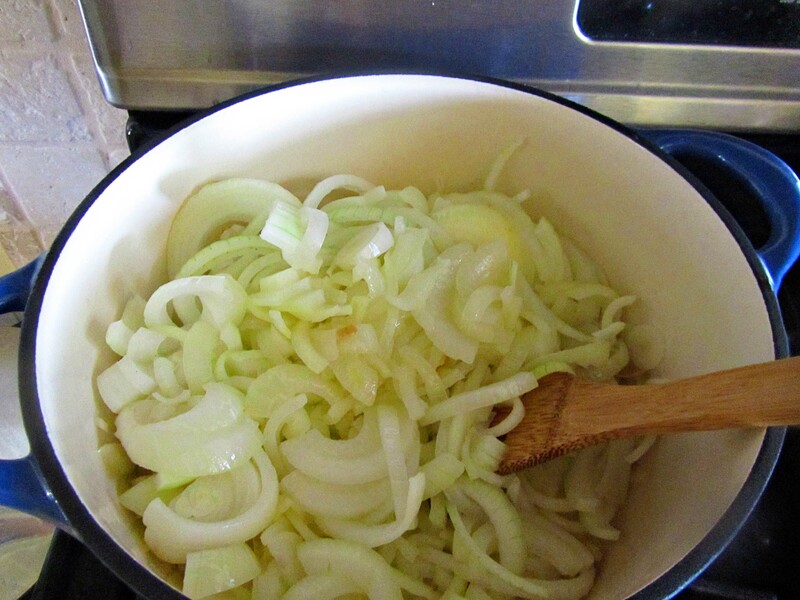 Add a stick of butter and then add all the onions. They cook about 20 minutes covered in a 400 degree oven, and then another hour or so uncovered. This is the result of 1 1/2 hours of cooking. 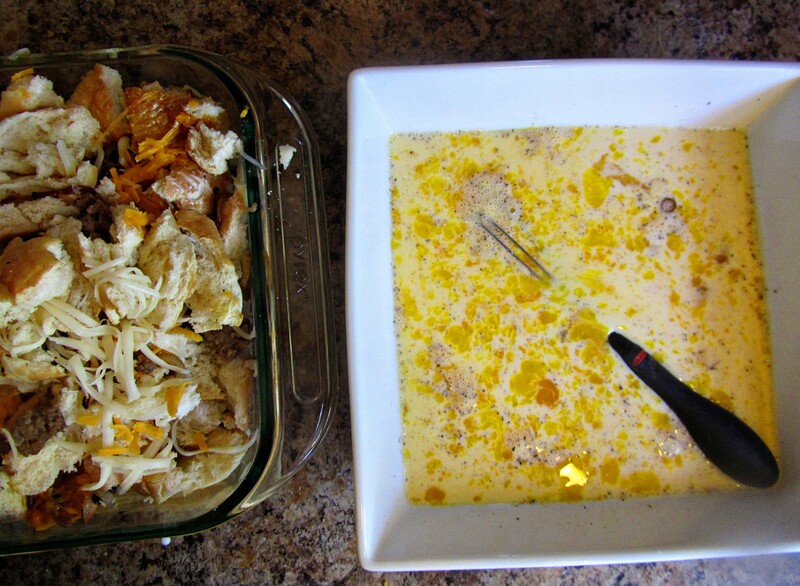 Put the pot back on the stove and add chicken broth,. . .
Now you let it cook another 45 minutes. 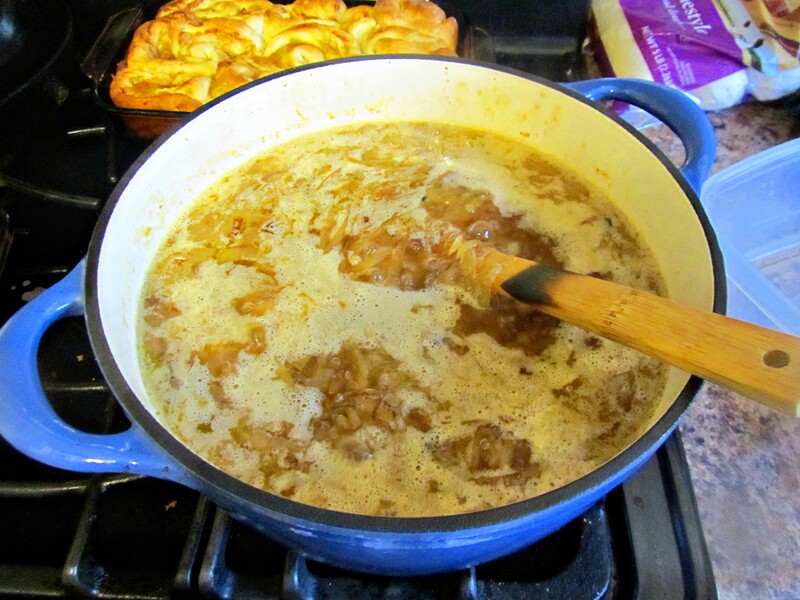 I was cooking this FRENCH ONION SOUP for the next day, so the 3 -4 hours it took to made didn’t worry me. However, this is in no way a last-minute dish. I served this one for our supper. To ease the guilt, I made mango smoothies. This handy gadget was given to me about a year ago, and I use it all summer long. 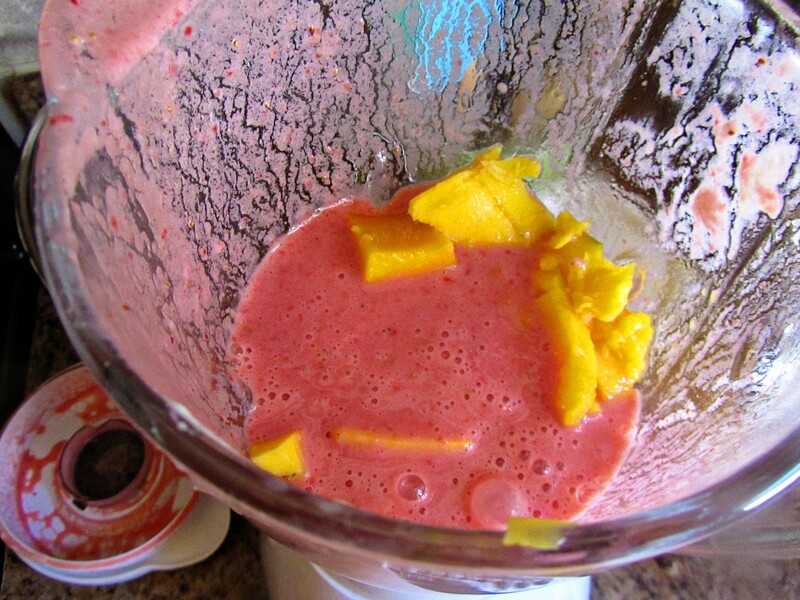 I buy mangos by the box and let them ripen, and then freeze them for smoothies in the winter. Therefore, I usually am cutting up 10 mangos at a time, and I just love this tool. You don’t peel the mango, just slide it down the center. Then you run your knife lengthwise and crosswise to cube the mango. The mango skin keeps the knife from cutting your hand. 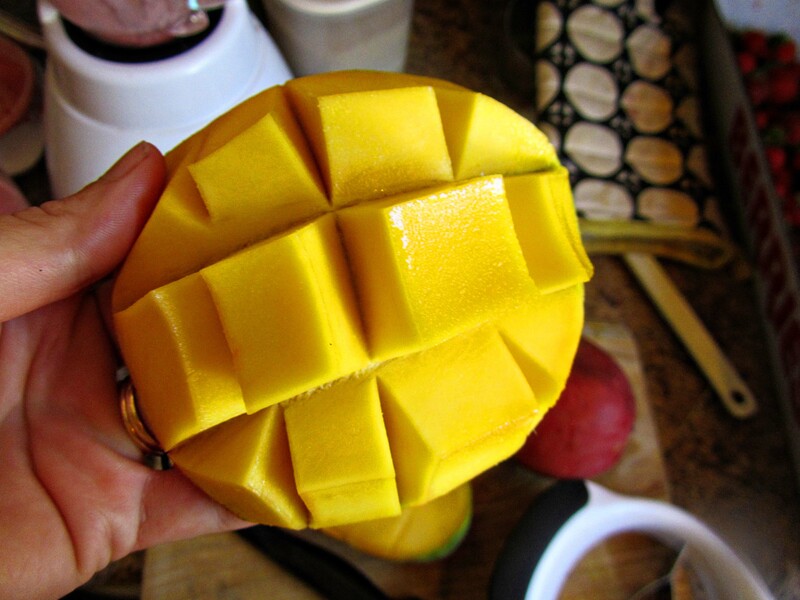 Then you turn the mango inside out, and cut off the mango cubes. Thanks Gwen. I love it. 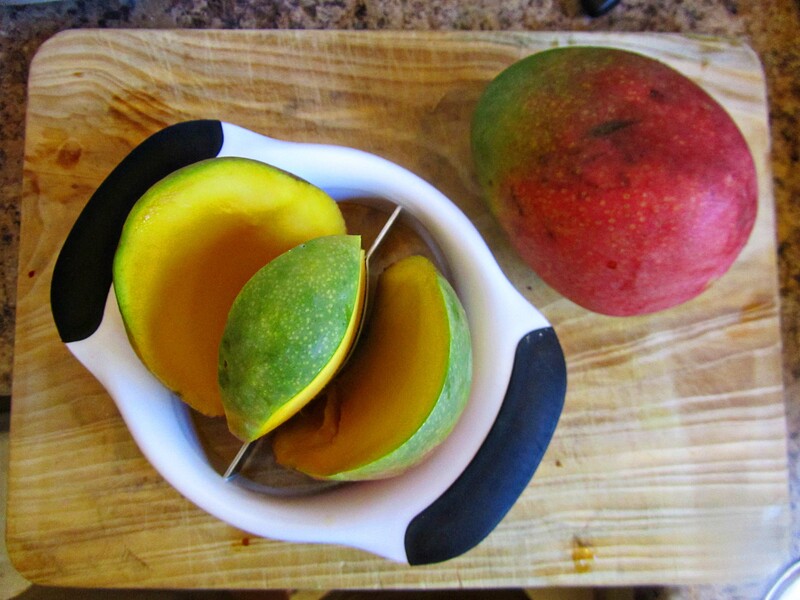 Here’s a video clip on mango cutting tips with or without the Oxo Mango Slicer. Supper is served. Well. Supper number 1 is served. The girls had swim team practice and the LBG (Little Big Guy) had a baseball game. A second supper will occur after the game. I will have FRENCH ONION SOUP, but they probably will just grab a bowl of cereal or more BREAKFAST BREAD PUDDING. The Hunni offered to take everyone to their places, and I offered to stay home. 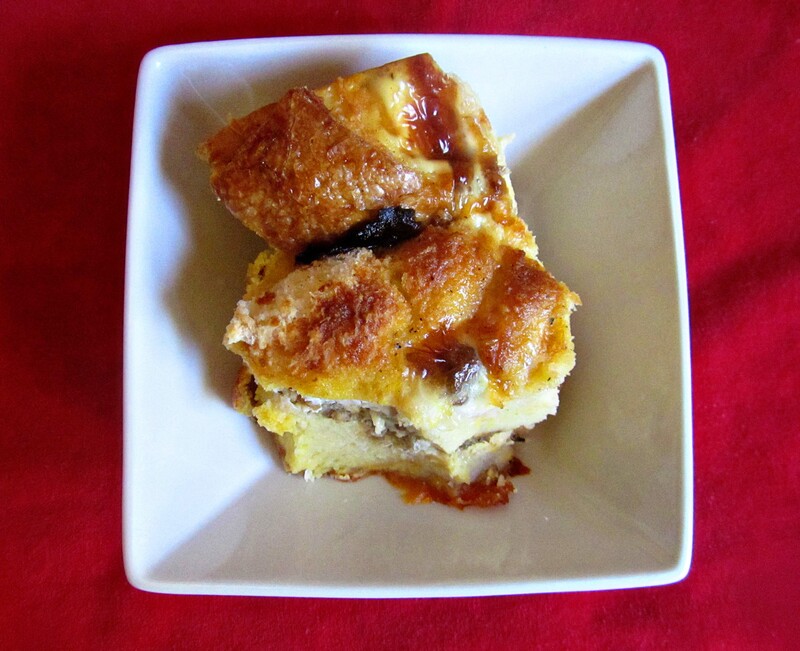 Then I ate some more BREAKFAST BREAD PUDDING. Pioneer Woman’s recipe doesn’t call for dry mustard, but I usually add a teaspoon to my recipe. I got that advice from a cook in Kentucky, and she was right. 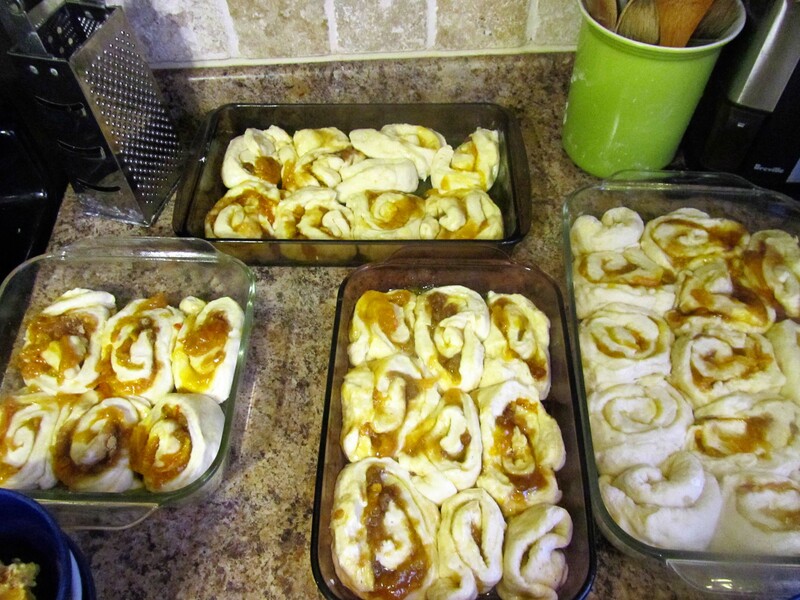 With my kid-less, duty-less evening, I decided to make some ORANGE SWEET ROLLS (pg. 14). Now I grew up having sweet rolls for breakfast every Sunday morning. 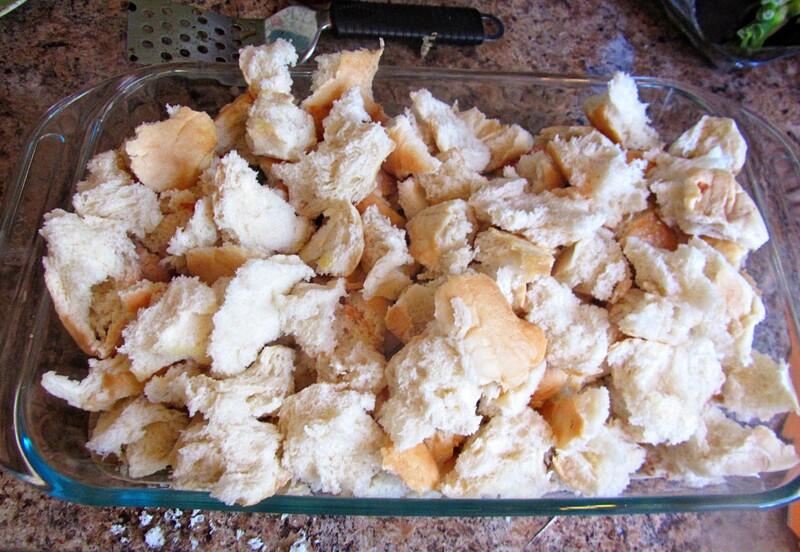 My grandma, who I might add had M.S., made several batches of sweet rolls for her three kids that lived locally. Then her and grandpa would drive around on Saturday afternoon to deliver the sweet rolls and stop in for a visit. If we weren’t home, they would just put the sweet rolls on the counter. It was all very casual, without any sense of obligation about being home when they stopped by. My grandma did that for about 10 years. 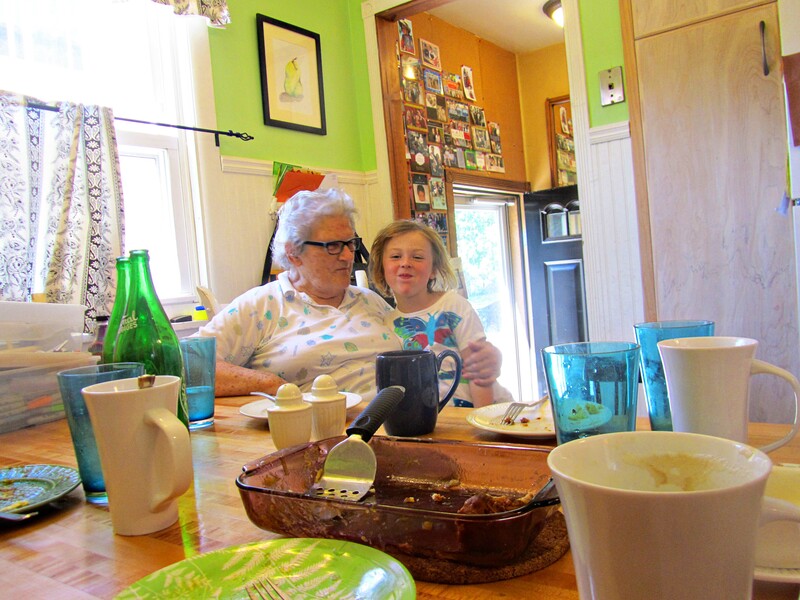 When making 5 batches of sweet rolls got to be too much for her, she bought everyone bakery sweet rolls for one year. Then she decided that season of her life was over. But we still remember. About one a month she would make Orange Sweet rolls. 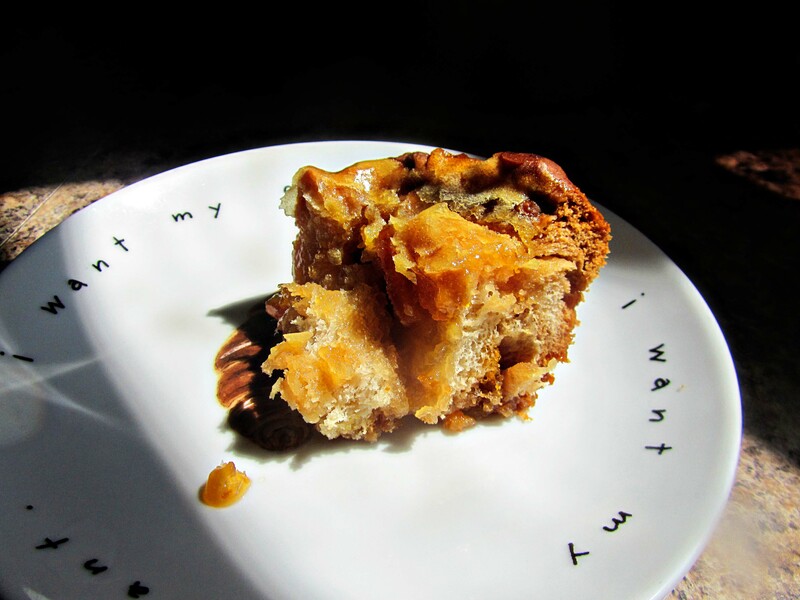 The rest of the time she would make Sticky Buns–sometimes with nuts and sometimes without. The lighting was bad, but the sweet rolls were delicious. The kiddos ate them as their second supper, plus a bowl of cereal. Which means they had three meals of just carbs for supper. Tomorrow I will try again with this whole feeding the kids healthy things. 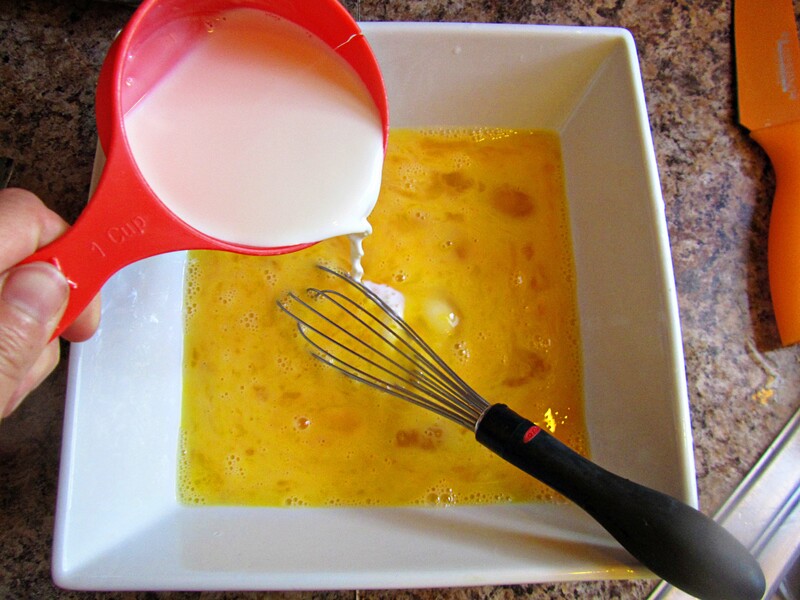 Tomorrow we will begin our day with ORANGE SWEET ROLLS. Tomorrow, our neighbor will come over and join us for a breakfast of ORANGE SWEET ROLLS, smoothies, and lattes. Tomorrow I will eat the last lonely sweet roll. 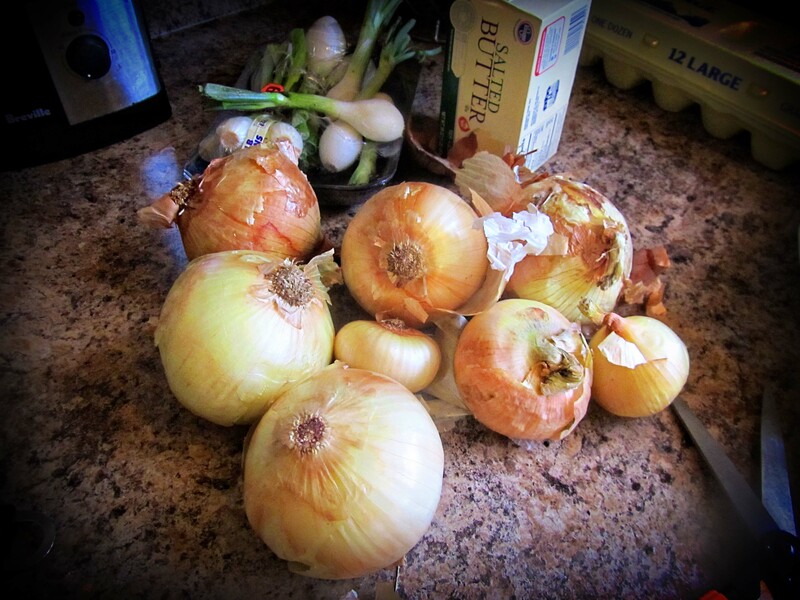 Tomorrow, I will have FRENCH ONION SOUP for supper. And the day after that, I will try to avoid eating Grains for every meal. 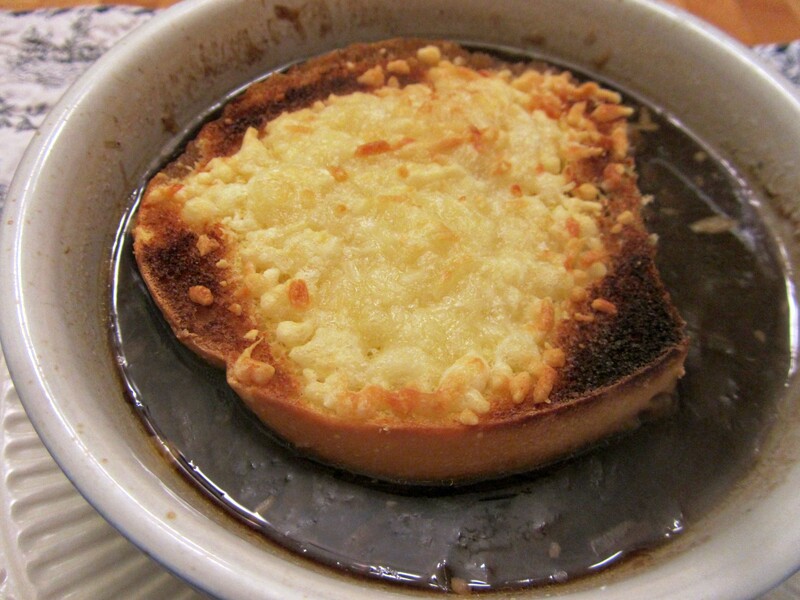 COMMENTS: Although I love FRENCH ONION SOUP, it takes a day to make. The kiddos didn’t particularly think it was worth repeating soon. I made a double batch, and plan on using some of the soup as a base for my beef stews and soups. 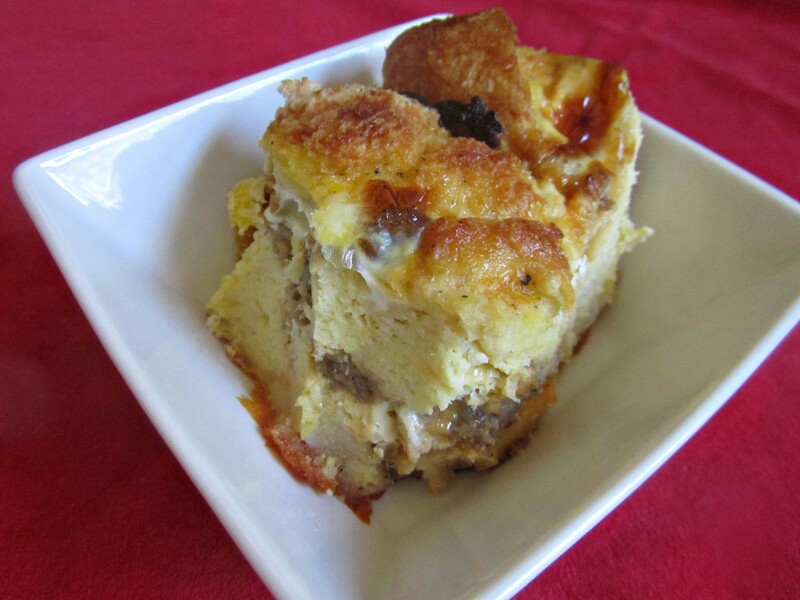 We love breakfast bread pudding, and often have it on Sunday morning. And ORANGE SWEET ROLLS, I could make them everyday, and nobody would mind. This entry was posted in Recipes and tagged cooking pioneer woman's cookbook, cooking ree drummond's cookbook, cutting an onion, french onion soup, smoothies. Bookmark the permalink. I look forward to trying the orange sweet rolls. One of my favorite traditions is my grandmother always having warm sweet rolls ready for us whenever we arrived for a visit at her house, every single time without fail. What a labor of love, and how interesting that you have a similar grandmother story. Wanted to let you know as well that Spicy Dr. Pepper Pork has been a big hit with our Aussie friends, except that I have had to substitute cherry coke and do my best to replicate the flavors of chilies in adobo sauce. 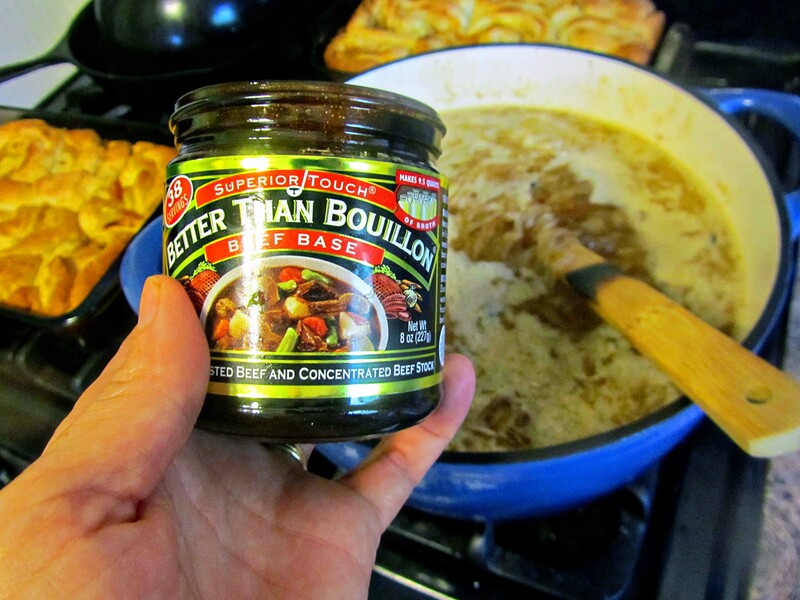 Mmmmm….I’ll be right over for some french onion soup! I’m here to answer your Kelty back pack question : ) We bought it used from a coworker for only $40–so it was a big time score. I’ve only had it with Nora and she is by far our lightest child, so I can’t really speak to how it holds up to heavier ones. She is only about 27 pounds now and when we are hiking it really does start to hurt my back quite a bit. I know that you CAN use them with heavier kids because when I was teaching, one of my students had these super fit parents who were training to climb Mt. Rainier. The Mom hiked an 8 mile hike near us (Mt. Si) several times a week with her kindergarten age daughter–40+ pounds– on her back in her Kelty to simulate the pack she would be using to climb Rainier. So, depending on how strong your back, and hips are, it can be done. I find that going downhill hurts the most, it makes my hips hurt and my legs really shaky. Going uphill, I can lean into the hill and disperse the weight a bit. BTW, the couple didn’t get to climb the mountain that year because the Dad got in a motorcycle accident at the end of the school year and shattered several bones in his leg. Oops–just glad he lived! Yum! Brings back memories of my grandma and her cinnamon rolls and orange rolls every Sunday night! Best.Thing.Ever! 🙂 So glad you like / use the mango slicer! Makes life so much easier!